This is my report of a recent five day trip in Everglades National Park with three friends. A detailed account of our planning and planning resources will follow in a separate posting. We launched late. Bruce Tom and Kaare (pronounced Carrie) didn't arrive at the park till noon. They stayed overnight in Naples, Florida, a 40 minute drive to from the park after a non-stop drive from Albany and Manhattan in NYS, and Princeton, NJ. I arrived at 11 am, partly because I needed to be out of my motel room by then and partly because I was tired of waiting. I used the time to load my boat. It took me an hour to load the boat and park my car and trailer. I had more gear than I could fit inside my three watertight hatches, so it took a while to decide what not to bring (I had brought 90 pounds of gear and five gallons - 50 pounds - of water). And there were many people around to talk to. Some were returning from trips. Others like us were just leaving. And more than a few were envious of our pending adventure and wanted to know all about it. By the time everyone was ready to go it was after 1 PM, two hours past Low tide, which made for an easier launch at this location (the Everglades National Park West boat ramp), as the ramp is mucky at low tide. We paddled in the Gulf till we got to the Chokoloskee Causeway overpass. Then under the bridge and along the deeper left side of the causeway channel, dodging speeding powerboats along the way. 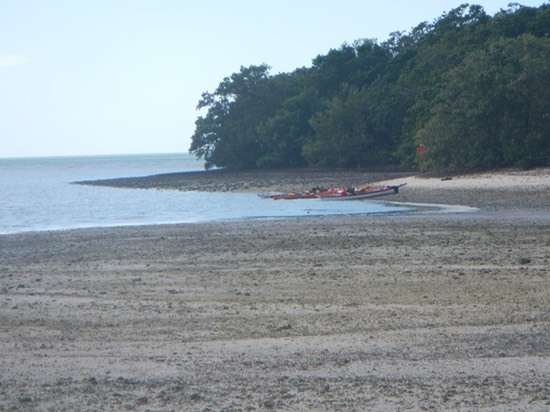 We paddled across Chokoloskee Bay along the left shore passing the mouth of the Turner River, then headed out around a group of mangrove islands toward what appeared to be the mouth of the Lopez River. A poorly labeled sign marked the mouth of the Lopez. Again hugging the left shore to avoid shallow water, Tom and I paddled upstream soon locating our campsite on the right-hand side at the old Lopez Homestead. This site is located on, what for Florida, is high ground. It is shaded and flat with room for two groups of four on sites separated by the remnant of a cistern and some old flower boxes. Each site has a picnic table and there is a shared port-a-potty. It is now 7 PM and dark. The crickets and other night creatures are serenading us with their quiet music. We are all in our tents, driven there by no-seeums and mosquitoes. It feels like it might be a warm night. 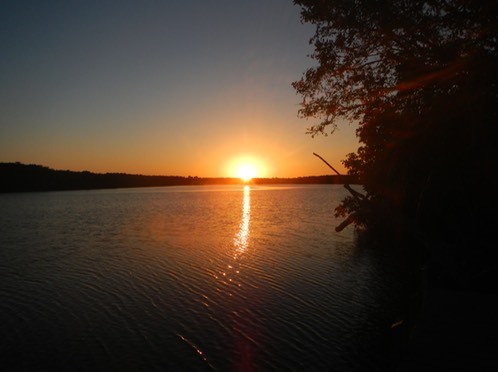 Tomorrow we enter the Everglades Wilderness Trail on our way to the Watson Place on the Chatham River. At the Watson Place: It is 7:02 PM and dark. We’ve been in our tents for 20 minutes, escaping the growing numbers of mosquitoes gathering outside. It is still again, with the soft night sounds of crickets and frogs accompanied by the occasional sharp whine of a mosquito flying nearby. Out on the river we can hear the blowing of dolphins is they surface to breathe. The setting is peaceful and serene. 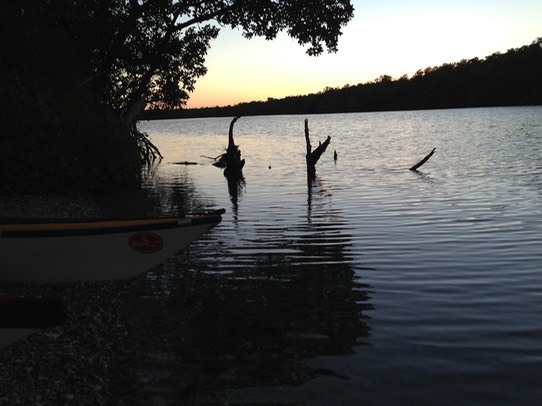 This is a beautiful spot, located at a bend in the Chatham River on one of the largest Calusa shell middens. To our south are the remains of Ed Watson’s big cistern. Nearby is the large iron bowl used to boil sugar cane into a syrup called Pride, reputed to have been the best cane syrup in southwest Florida. It is now filled with stagnant water and duck weed, one of the few sources of fresh water for the island’s raccoons and other creatures. Watson farmed here for twenty years before being shot to death by a mob on Chocoloskee Island in 1910. Watson’s carefully tended thirty-five acres are now overgrown with the invasive Brazilian Pepper. The place is said to be haunted by evil spirits, but I do not feel that evil presence in this place. 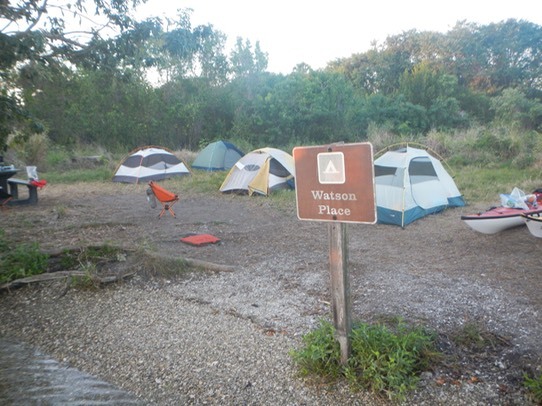 Our site at Watson's Place is spacious with camping on soft grass. The National Park Service says the site will accommodate up to 20 campers. I can't quite picture that. We might get two or three more tents on the site, but not 20. Thankfully there is only our group here tonight. Our trip here from Lopez was just under 11 miles but seemed longer. We were fighting tides and wind most of the way. We passed through three large open bays (Sunday Bay, Oyster Bay and Huston Bay) where the wind was strong and kicking up waves. 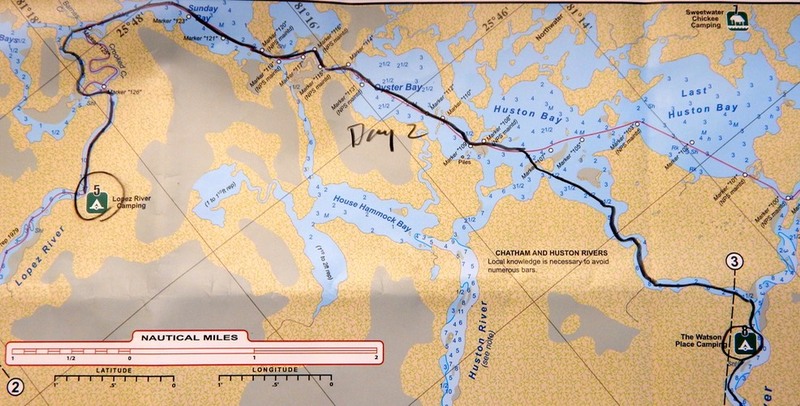 We finally reached the Chatham River and the Watson Place in the early afternoon. We arrived around 1 PM. 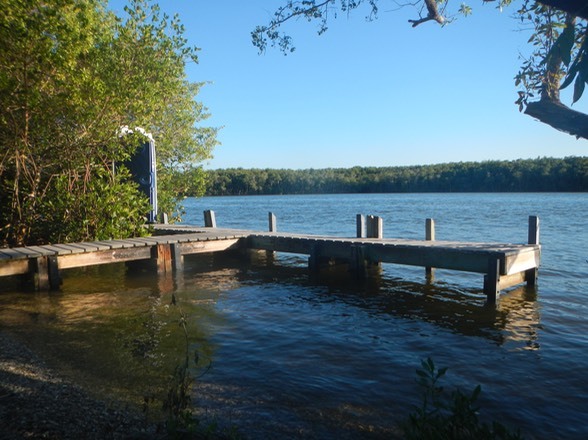 There is a dock and a small shell covered landing but no real beach where we could leave the boats. We did a four-man carry on each loaded boat to place it high and dry. This made for easier access to our gear as we set up camp. Soon we ate lunch and then spent the rest of the afternoon sorting gear and just sitting and talking. It was a lovely and peaceful afternoon. Now the sun is down and our warm day is beginning to cool. Still, I expect another warm night like the last. Tomorrow it's down the Chatham River to Pavilion Key on the Gulf with a planned stop at Mormon Key. At Pavilion Key: We sat on the beach at Pavilion Key, close to the water between our boats till the last remnants of color left the sky and the no-seums drove us into our tents. It was the close of another glorious day. We left the Watson place around 9:30 AM. We still had almost four hours of falling tide to carry us down the river. The Chatham river is apparently hard for power boaters to access. We saw and heard not one in all our hours on the river. 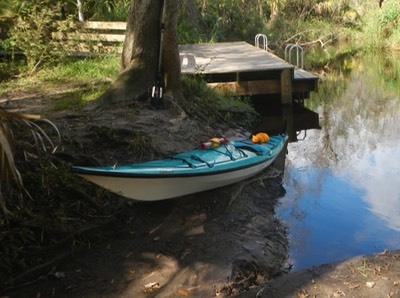 This was to our benefit is the Chatham is beautiful and wild with side creeks that beg to be explored (I have since learned that many of these straight "creeks" are actually canals dug by the Calusa Indians to reach the interior of the islands they were creating). We found it much more interesting than the Lopez River. We saw many different birds on the river and numerous dolphins feeding all around us. Bruce was startled by an equally startled gator he paddled to close to without seeing it. It jumped off the shore making a loud splash just behind his boat, never to be seen by us again. Our navigation worked pretty well between the maps and GPS units Bruce and I had. 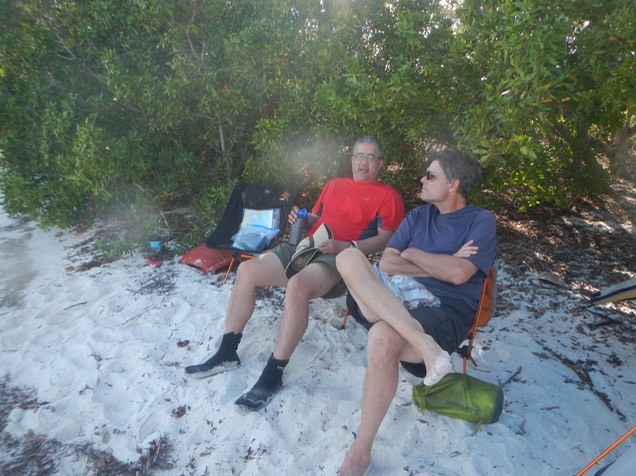 We found our way out of the river and into the Gulf of Mexico making our way to Mormon Key where we took a break to eat and hydrate. Then we paddled toward Gun Rock Point before turning west toward Duck Rock. 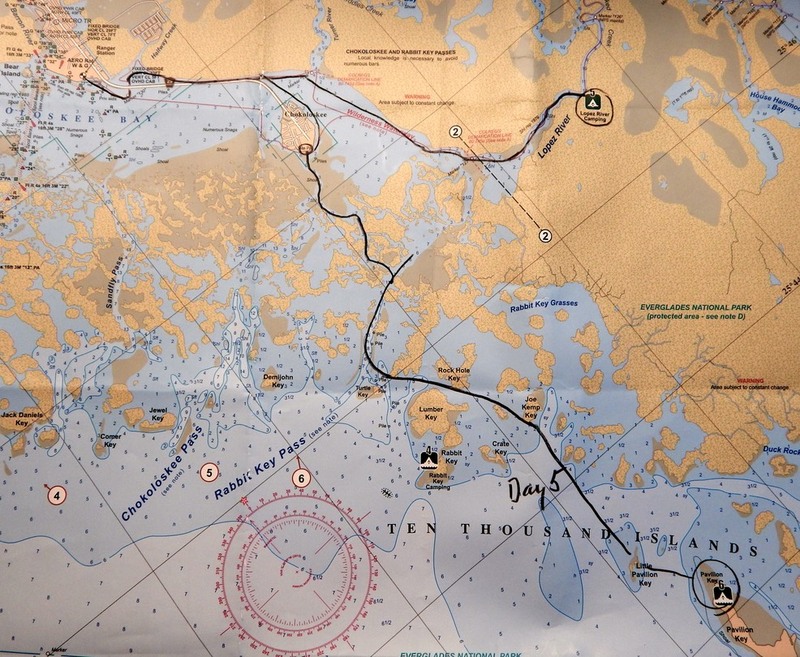 We bypassed duck rock and paddled behind a shoal and along two unnamed islands before reaching Pavilion Key, our destination. 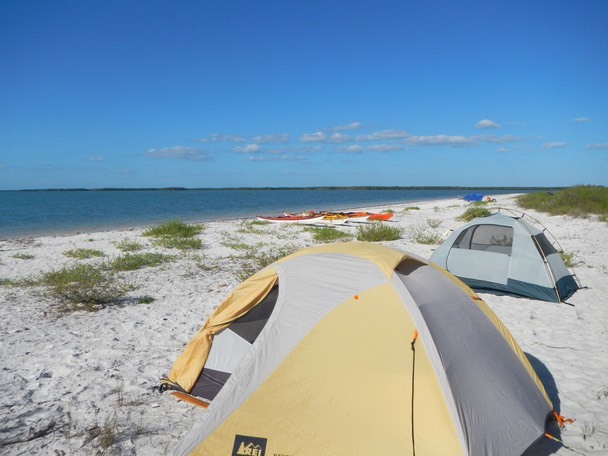 We arrived at the south end of Pavilion Key and proceeded along the outside western shore until we reached the National Park Service campsite (As it turned out we could have reached the campsite just as easily from the Eastern side of the key). Bruce and Kaare decided to set up their tents on the beach. Tom and I thought the sun was too intense there, so we elected to set up back away from the beach in the shade of some trees. This seemed like a good idea until the no-seeums came out. Tom is a bug magnet and they were making him miserable. Me, not so much. Finally, he asked me to help him carry his tent out to the beach. This left me alone in the off beach area. I felt isolated and a bit antisocial, so after a a while I unloaded the gear from my tent and carried it to the beach followed by all my gear. It was hotter on the beach but there was a nice breeze to keep help keep the bugs down . We cooked dinner sitting between our boats, using them as tables to prepare our dinner. It's now 8 PM . Everyone is in his tent, reading or housekeeping. Looks like another warm night. We day paddle from Pavilion tomorrow, then stay here another night. 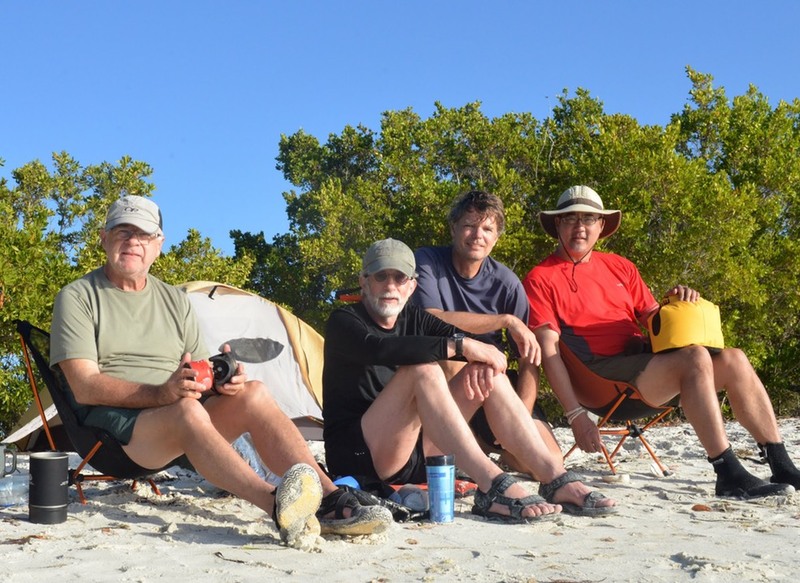 When we got back to camp after a round about paddle to Rabbit Key, Kaare and I landed while Bruce and Tom continued to paddle around Pavilion. Kaare and I grabbed our chairs and found a spot in the shade on the opposite side of the key where there was a strong cool breeze blowing. When Bruce and Tom returned they landed on this same side which was opposite our camping area. This seemed peculiar. Next thing I knew they were carrying their tents across the island to set them up in the breeze. For Tom this made some sense as he's terribly bothered by biting insects and the wind keeps them away. In any case, next I see Kaare carrying his tent over to this side too. They offered to help me carry mine as well but I declined firmly and when I saw where their tents were placed I was even more sure of my choice the three tents were crammed into a tiny space. Tom’s tent was back a bit and on level ground. But Bruce's tent was on a downward slope, head to toe. Kaare’s was even worse, sitting on a slope running downward and sideward. Worse yet, both of these tents sat about five feet from the high tide mark. The wind was blowing a gale and the tents were quite windblown. It was hot where my tent was but it would get cool at sundown. We sat in the shade and talked in this new location. Tom and Bruce went for a walk while Kaare and I watched a shark feeding in shallow water not twenty feet from shore. 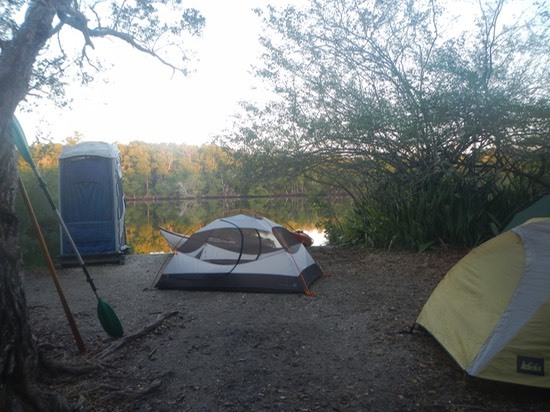 Kaare kept worrying about how close his tent was to the high water mark. Finally he unloaded it again and moved it down the beach to a more secure location. Then, while Bruce and Carrie were off somewhere, Tom noticed a horseshoe crab in the surf. 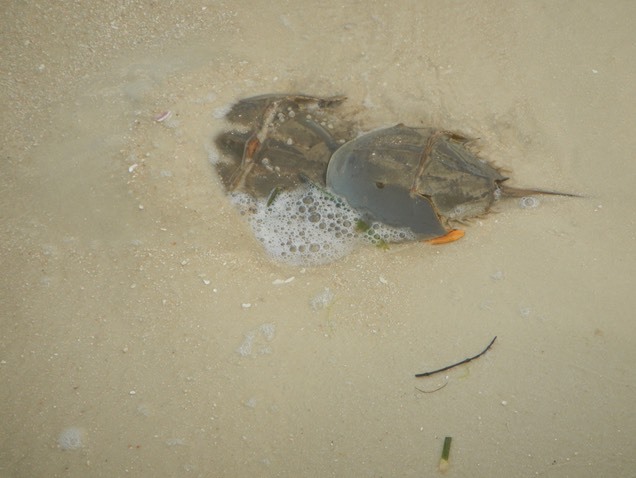 On close inspection it was two horseshoe crabs mating . We saw at least one other mating pair on that short stretch of beach. 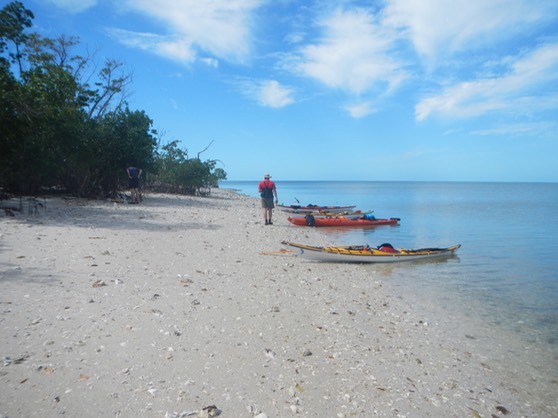 We had a great day paddle to Rabbit Key. 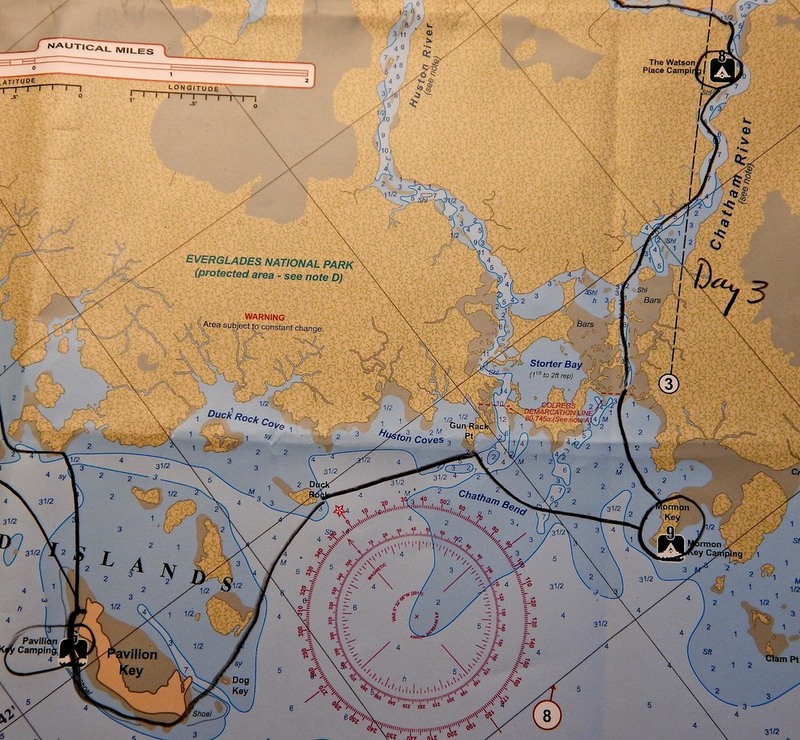 Our route took us one mile in toward the shore, then along and among a series of mangrove islands to Crate Key. From Crate Key we jumped to Rabbit Key where we spent time eating lunch and exploring. 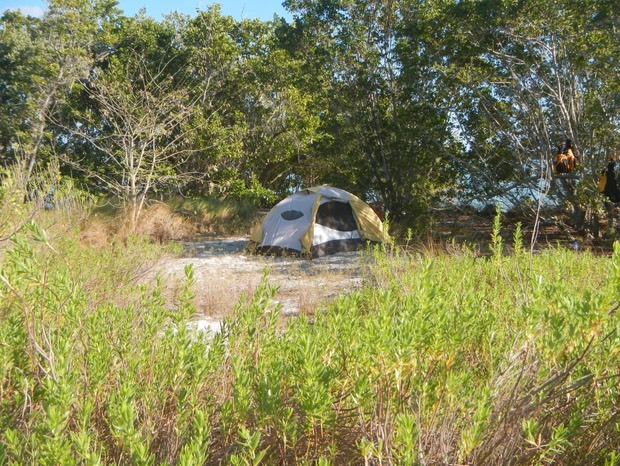 Rabbit Key was one of our options as a camping location. But on inspection it appeared to be a much less desirable site. 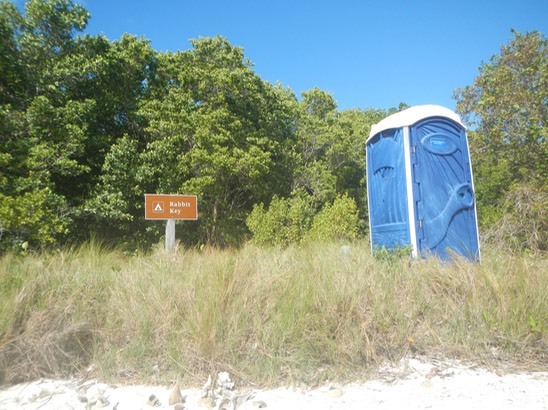 It was small and poorly serviced by the National Park Service, with the Porta-John dirty and overflowing, no toilet paper and a mucky landing area at low tide. It was said that the site would accommodate two groups, but we could only find one small cleared area for camping. 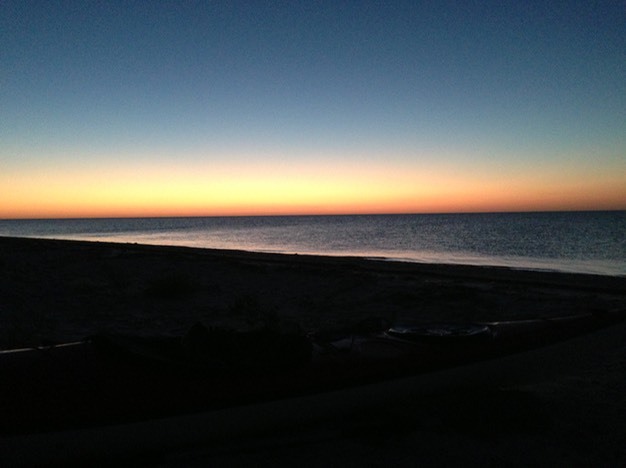 We left rabbit paddling into the teeth of the rising wind and headed for Joe Kemp Key. On the way we were surrounded by dolphins feeding. At Joe Kemp we had a heated discussion about which of two routes would give us the most protection from the wind and waves. In the end it appeared that either route afforded reasonable protection from the wind. 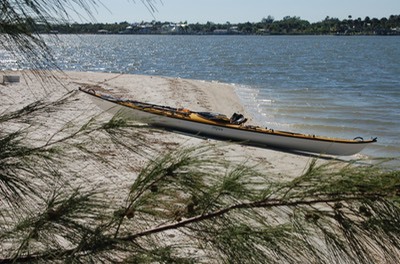 From Joe Kemp Key we paddled almost due South, between some mangrove islands to the tip of a large unnamed mangrove island where we made the final mile and a half jump back to Pavilion key against a strong headwind. It is now 8:05 PM. I am in my solitary tent on the north side of Pavilion key and glad to be here. I can hear the wind and waves on the South shore hammering my friends. But that's what they wanted. At least there shouldn't be any bugs over there with that wind. Tomorrow we head back to Everglades City and the end of our adventure. 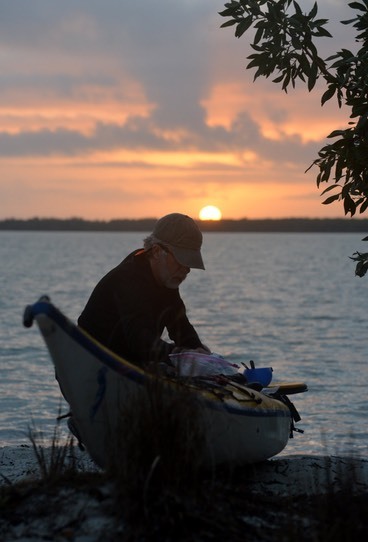 Bruce and I ate our usual breakfast of instant oatmeal and coffee next to my boat on the northwest side of the key, while Tom and Kaare stayed on the southeast near their tents. 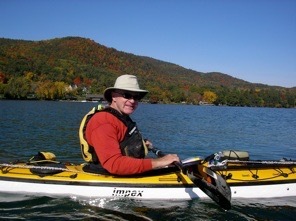 Tom, always eager to get started, had his tent down and gear packed in his boat long before the rest of us. He would walk around with his spray deck, PFD and paddling hat on putting pressure on the rest of us to get going, without saying a word. I got my stuff together and packed into my boat in the still morning heat. I was sweating like a dog and must have looked red in the face when Tom and the others came to see if I was ready. One look and they told me to find some shade while they paddled around to my side of the island to help me launch my boat. I guess after my heart scare on our last trip together, they weren’t taking any chances. But I felt fine. I just sweat a lot. 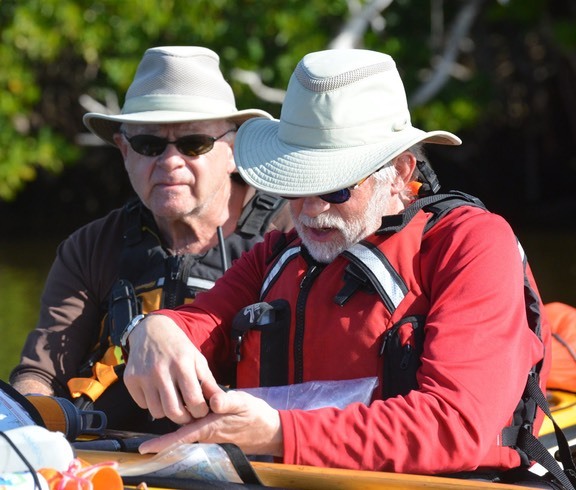 Bruce and I discussed a general plan for our return route to Everglades City. He wanted to take Rabbit Key Pass instead of Sandfly Pass as I suggested. Sandfly was a direct route back to the park launch ramp. 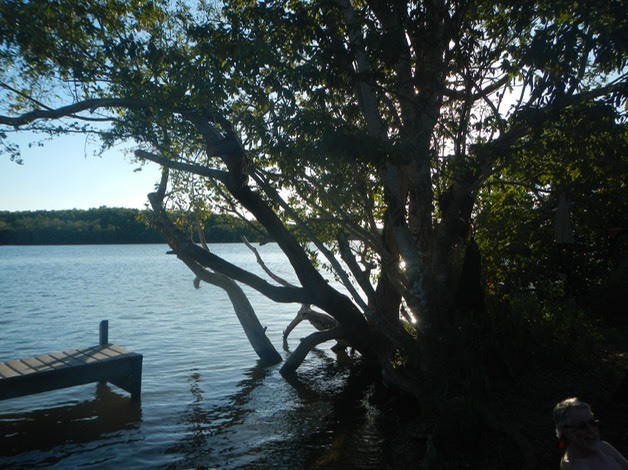 It looked like Rabbit Key Pass would take us back to the mouth of the Lopez River. This didn’t make sense to me until he finally pointed to what on the map looked like a small left hand channel that led from Rabbit Key Pass directly to Chocoloskee Island and Smallwood’s Store. This was a good plan that would allow for a break at Smallwood’s . 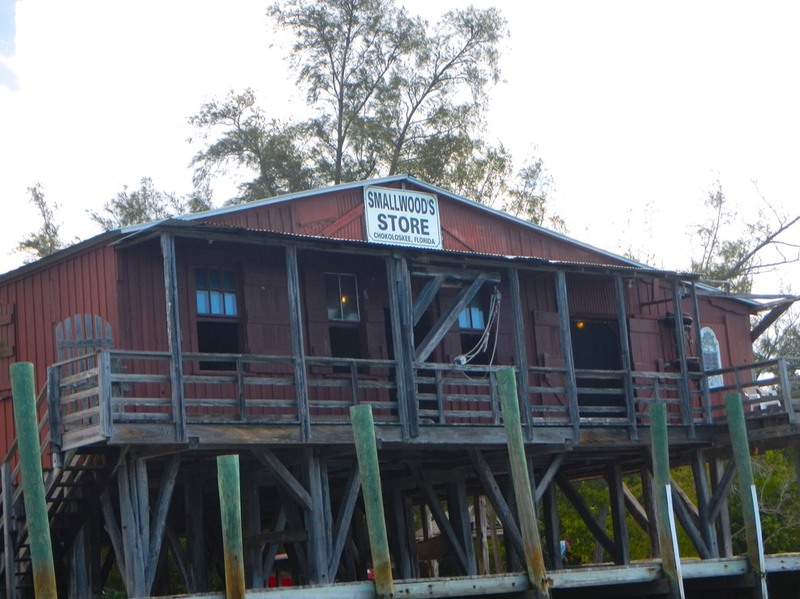 When we landed on the beach at Smallwood’s, we headed inside for a look at what is more of a museum than a store. It’s an interesting place and well worth a visit. Bruce bought everyone a soda from an antique soda machine. The drinks came in 8 oz. glass bottles. I hadn’t seen bottles like that in almost fifty years! Back Outside we had another heated discussion about our return route to the park’s Ranger Station. We could paddle outside in the Gulf as Bruce proposed, or we could paddle inside, along the back of Chocoloskee Island and the Chocoloskee Causeway Canal. Distances were about the same either way, but there was a strong wind blowing on the Gulf and rising seas, so we elected to paddle inside until we reached the causeway bridge. The passage under the bridge was interesting (that’s an understatement). the combination of wind, waves and tide, compounded by waves rebounding off the bridge abutments made for very chaotic conditions. In the Gulf once more, we made our last push for home. Once on the beach, we unloaded our boats, packed our cars and said our goodbyes. Bruce, Tom and Kaare would travel back to Naples for the night, then leave in the morning for their non-stop trip home. I washed up as best I could in the National Park’s men’s room, shaved and changed my clothes before grabbing a hamburger at the Island Cafe and starting my four hour drive home. It had been a great adventure.